Skeletal muscle contractions and their attendant increase in metabolism accelerate production and accumulation of multiple metabolites in the cytoplasm, interstitium and vascular compartments. Continued myocyte contractile function and subsequent recovery is often highly dependent upon constraining metabolite accumulation. In particular, the control of pH ([H+]) during exercise is absolutely crucial for muscle force maintenance and metabolic regulation. This short review focuses attention on the dynamic control mechanisms that help regulate H+ and thus intramyocyte pH (pHi) during muscle contractions: Specifically 1. Myocyte H+ production and intrinsic buffering systems, 2. 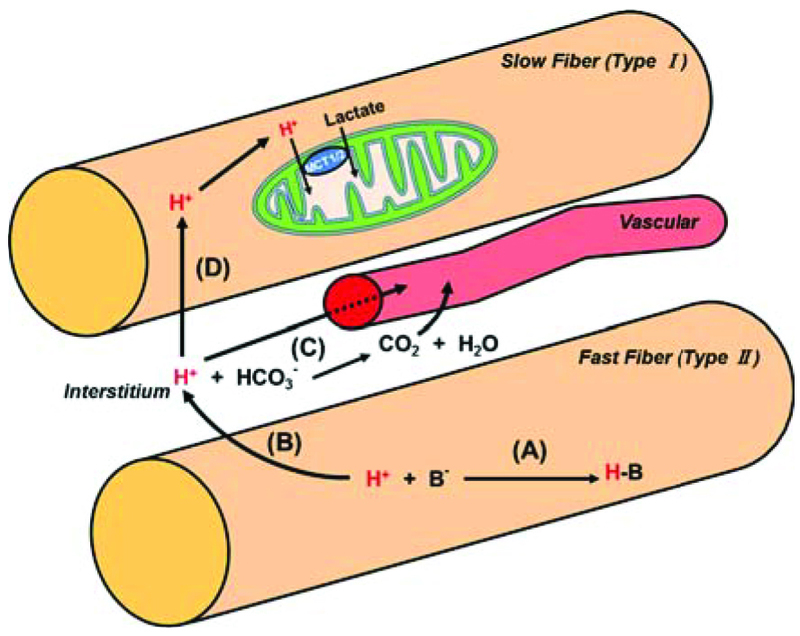 Mechanisms of myocyte H+ excretion, and 3. Inter-relationships among the intramyocyte - interstitial – blood [H+]. Skeletal muscle, pH regulation, Bioimaging, Fatigue, Mitochondria, Fluorescence indicator, Membrane transporter. Department of Engineering Science, Bioscience and Technology Program, University of Electro-Communications, Chofu, Tokyo, 1828585, Japan.